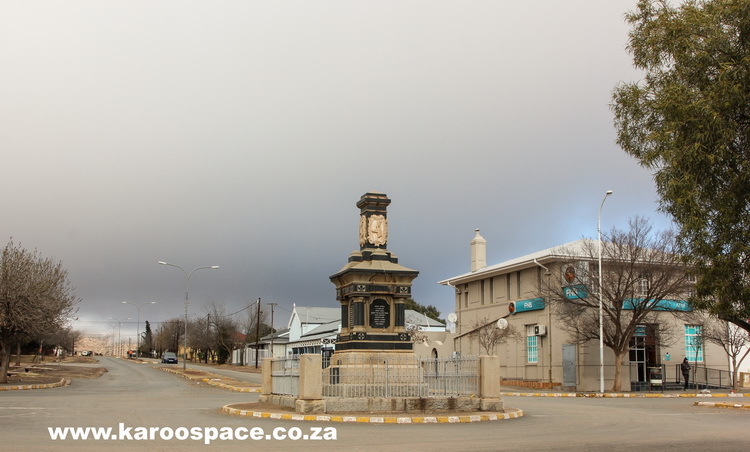 The War Memorial in the centre of Tarkastad, Eastern Cape. 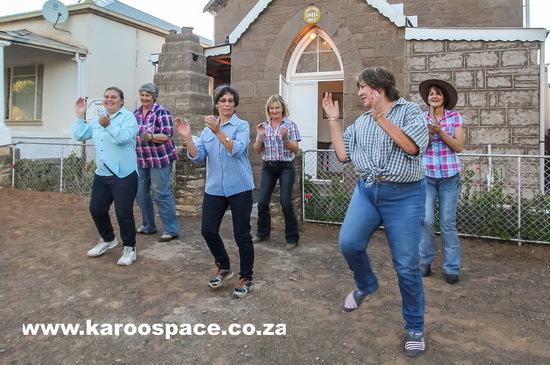 If you want the real skinny on the little Eastern Cape village of Tarkastad you will have to drop in on the line-dancing ladies and do the Flea Hop to the tune of Achy Breaky Heart. As they say out here: “Boet, to get the low-down, you have to hoe-down.” Actually, I just made that up. But they really should start saying that. 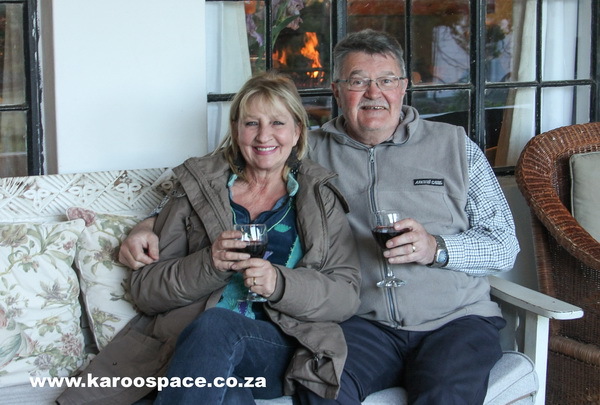 On Tuesday and Thursday evenings the Winterberg Moth Shell Hole Hall just opposite the Moederkerk reverberates to the magnificent warbles of Billy Ray Cyrus, Abba and the kind of nostalgia you might pick up on a late night LM Radio playlist. Line dancing in Tarkastad at the local Moth Hall. With venerable old fans spinning lazily above them, a sixpack of women (‘the men are just too chicken”) are in another world, where terms like the Cowboy Charleston, Two Step Shuffle, Swing and Cha-Cha make perfect sense. Their counterparts over in Australia would be hoofing it to the Bug Squish, Applejack, Sugarfoot Swivel and Buttermilk. But it’s all good, clean, line-dancing fun in the end. Tonight, Debbie Sparks leads the squad through a dazzle of foot-stomping rhythms. 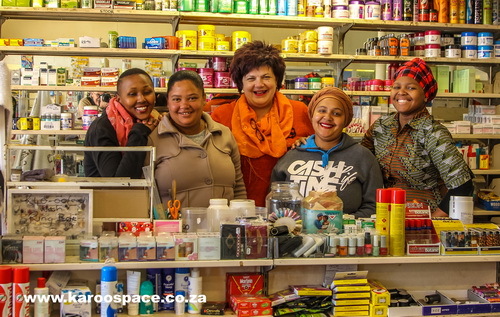 With her is Renette Bernard the butcher-lady, Dalena Smit the music teacher, entrepreneur Charmaine Jonk, Georgie Els who runs a pre-school and Samantha Heath, who helps her out. I want to know if they were inspired by some line-dancing guru or landmark movie. “Ag no! It’s just boerestyle. We hunt it down on YouTube and then practise the steps from there.” That’s how you make your bubble in the platteland: find your buddies and follow whatever madness rocks your boat. Jo and Georgie Els, two of the cheerful faces of Tarkastad. With country music rattling around my brain, I stroll the short distance from the veterans’ hall to the home of an old friend (and local magistrate) Jo Els. Over a wine or two, the genial beak with the heart of a classic rocker (if you rate the music of the lesser-known Little Feat you’re one as well) tells me being a country magistrate has its little peccadilloes. As the legendary blues singer hits his stride and the Els home is flooded in a crescendo of bass and harmonica, here comes his wife Georgie, flushed from her line-dancing session. “Hello Bokkie!” she greets me with a Tarka hug. We make arrangements to meet at her Smurfies Pre-School the next day and I chug out of town towards my temporary digs at Blanco Guest Farm. 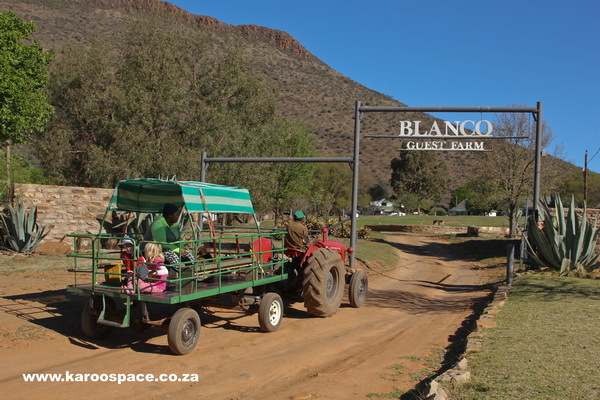 Riding into Blanco Guest Farm, Tarkastad. You know those old family resorts you normally find in the hidden folds of the Drakensberg? The ones where you went as a child, as a teenager, as a parent and then in your later years in the company of your clan? That’s Blanco, which has been around for yonks and yet, in this modern world of multi-generational travel, is as trendy as a Tesla runabout. It’s a cluster of well-kept old cottages and bungalows with a central house which doubles as a dining room, bar, lounge, reading room and huge stoep from where sunsets can be viewed – preferably through the amber tones of a good whisky. Children love the place. They ride horses, go on afternoon tractor adventures, share meals in a specially-designated dining area, pay cautious visits to a vast pig called Ongi, attend the daily cow-milking ceremony and generally disappear quite safely from constant parental observation. Parents love Blanco as well, for obvious reasons. Romantic couples slide into a cottage and emerge wistfully at departure time. Food isn’t fancy, but it reminds one of youthful days. Basically, Blanco is as retro as you can get – which is why I like going there. The Angels of Smurfies Pre School go on walkabout with their bompies. The morning finds me in the company of angels and fairies and elves in the middle of Tarkastad. The kids of Smurfies Pre-School are practising for their annual play, singing and dancing and sucking on sweet ice lollies they call bompies. I see Jo the magistrate somewhere in the background, keeping a low profile. He’s been banned from Play Night, because they say his nerves can’t stand the tension of live performance. Imagine that, I muse to myself. A big man who is battle-hardened from a thousand bruising court cases turns to jelly when little angels with bompies rehearse for a pre-school production. I live for these moments of delightful irony. The pharmacy ladies of Tarkastad. We set up a group photograph with Elrina and her staff. The women all sidle off to the sample counter to apply fresh lipstick, mascara and such. You hear no complaints from me, because a dash of lipstick always makes a portrait pop. 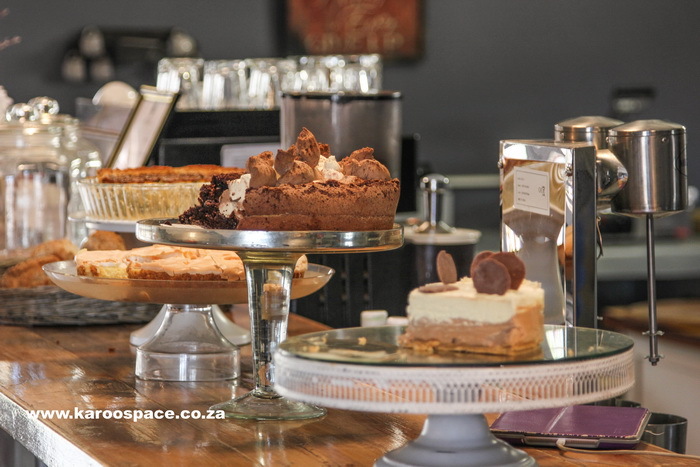 Fresh bakes at The Story in Tarkastad. Lunch is at The Story, one street down. Each day of the week this delightful restaurant (and gift shop) is run by a different Tarka farmer’s wife who brings her own flair (and meal of the day) to the party. 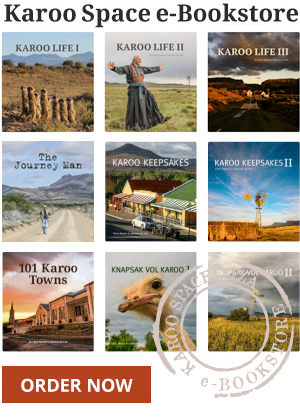 Profits go to a specific cause every month: the local orphanage, the old age home or a general spruce-up of the town. Kitty Philips, one of the founders, invites me to visit a very special Tarkastad asset the following day. Bright and early, I am driving behind Kitty a few kilometres out of Tarkastad to the spectacular Orange Grove School, which stands on a farm below the most beautiful aloe hill I’ve ever seen. 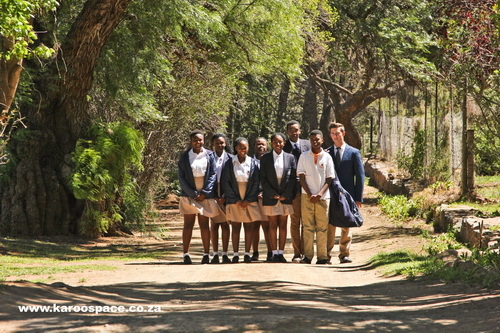 Some of the singers of the Orange Grove School outside Tarkastad. Kitty and other local parents were not keen on following the rural tradition of sending their children to one of the prime-grade boarding schools in Grahamstown or Port Elizabeth. “I thought why not keep our kids right here, in this beautiful place?” she says. The school follows what is known as the Accelerated Christian Education system, where pupils learn at their own pace and only proceed to the next grade when they are ready. 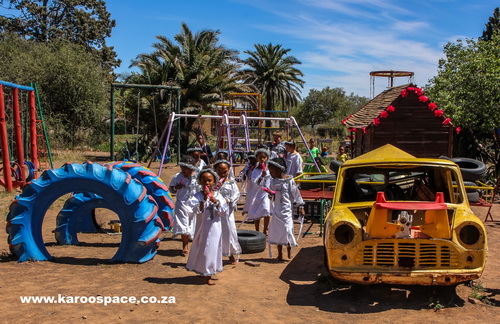 One of the staff, Dave Hood, is responsible for the outdoors curriculum which includes the children spending a lot of time in the Eastern Cape veld. They go off looking for spoor, collecting bones and insects and interesting plants and stones. The evening finds me deeply ensconced in another natural world, that of stoep-side at Vrede Farm on the other flank of Tarkastad. Walter and Alida Schulze are talking Bonsmaras but I want to know the inner secrets of the Tarkastad Canoe Club. After all, what’s a canoe club doing in a very dry town? “That’s a story for another time, boet,” says Walter mysteriously. “Here, have a tjoppie.” Perhaps with a bompie to follow? 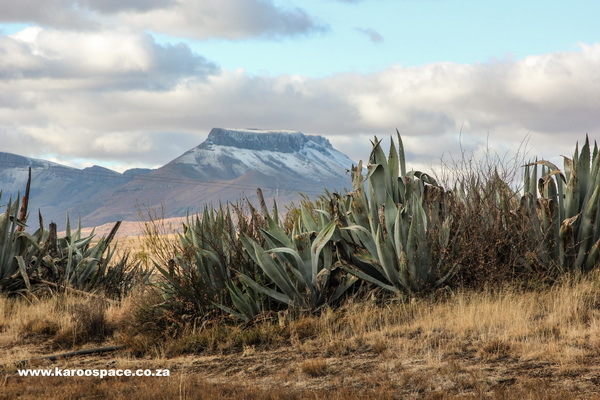 The magnificent mountain view from Vrede Farm outside Tarkastad. Would love to make contact with your line dance group and invite them to attend our line dance social in Somerset East. Leave a Reply to Antoinette Ah Yui Click here to cancel reply.